My friend Natalie is sharing on the blog today. She is one of those people that will always be very near and dear to my heart no matter how many miles separate us. Love that girl! Natalie, I hope the hills of West Virginia are preparing to display their beautiful colors of fall for you soon! Having been there before, I know it is quite a site to behold! 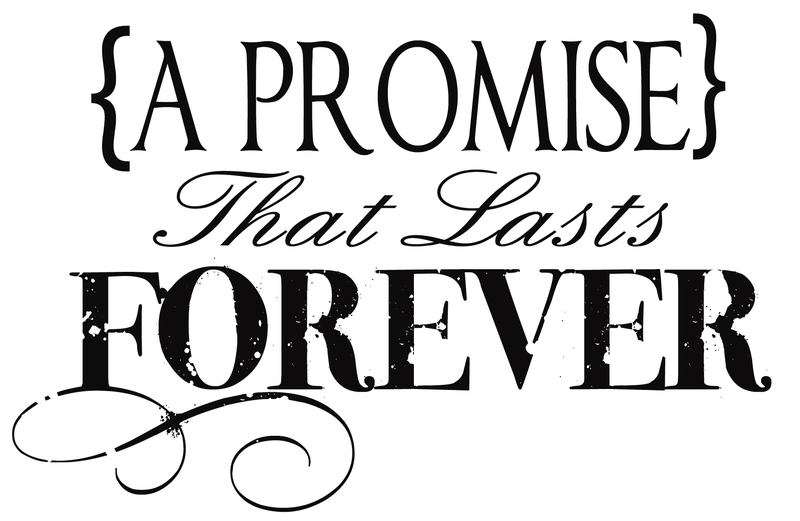 Have you ever broken a promise or a commitment? I’ve said I would do something, made a commitment to a person, and didn’t follow through with it for whatever reason. I may have had a good excuse…and maybe I didn’t. Either way, we have all been on both ends of this situation. You’ve broken a promise. Someone else has broken a promise to you. It ends in disappointment. If the promise was very important to you, the breaking of it may have chipped away a small piece of the faith you have in people; possibly a small piece of the faith you have in yourself. I’ve noticed that, in my own life, I’m constantly measuring the faithfulness of people to me and to others. If they say they’ll do something and they don’t, I make a mental note and I tend not to forget that I can’t depend on them. It’s part of the process of my personal wall-building. I’m always preparing myself for disappointment…so I don’t feel disappointment when the “disappointment” happens; when the promise isn’t fulfilled. I’ve been committed to Christ since I was 12 years old. Since that time, I’ve learned repeatedly about God’s promises. God promises us general things in His Word. He promises us specific things through words we’ve received through the operation of the gifts of the Spirit. We believe them and we stand strong because we KNOW that God is faithful. We know that God will NOT disappoint. He will come through because if His word is not true, then His kingdom collapses. His heart is faithful to us and He gives us promises because He loves us. What has He promised you? Did you know that there are over 7,000 promises to God’s children written in the Bible? I’ll name a few of them: salvation, eternal life, a new heart and a new spirit, direction, the desires of our hearts, peace with our enemies, all our needs, provision, strength, blessing, a “crown of life”, prosperity, success, restoration, a hiding place, preservation from trouble, a spirit of power, love, and a sound mind, a future, hope, mercy, grace, and adoption. This list could go on…have you done the math? I only named 25. Just thinking about those promises alone reveals that God cares enough, is strong enough, wise enough, powerful enough, and loving enough (infinitely enough) to be faithful to us! Having said all that, there is a pressing issue that’s been swirling in my heart as of late. You see, I’ve been wondering about the foundation on which we are building our lives. I’ve been picturing the analogy that the Bible uses in Matthew 7:24-27 about the wise and foolish builders. One man built his house on the sand and the other built his on the rock. The house built on the sand was ultimately unstable and destroyed while the man whose house was on the rock was stable and stood because of the “dependable” foundation on which it stood. What if each one of those promises were grains of sand on which we’ve built our homes (our spirit, our spiritual lives, our very beings)? What if each of those promises shifted or were washed away or became unstable like the grains of sand? If we have built our homes on those promises and the promises wash away, will our homes still stand? Let me reiterate that God is not a liar and His promises are true and real. I’m simply posing the question to reach a point of examination for our own hearts: what if God’s promises were taken? This brings me to the story of Abraham (Abram to begin with). You may know the story of Abram and Sara, who were growing old and had no heir. In that time, a couple may have felt cursed or desolate if they did not bear children. This is where they were: a state of barrenness. However, God later promised Abraham and Sarah an heir…and not just an heir, but heirs enough that the stars in the sky and the grains of sand (ironically) would not be numerous enough to count their future descendants. Of course, Abraham and Sarah struggled with trust while waiting on God to prove His faithfulness to them. We’ve all done that, haven’t we? “God…are you kidding me? You’re not going to come through, are You? Have I done something to mess up the promise?” Can you relate? The point is to say that God did come through and He did give the promise of what He said he would give. They had a son, Isaac. However, in the midst of their story, which takes place in Genesis, something huge stands out to me. In Genesis 15:1, the Bible says, “After this, the word of the Lord came to Abram in a vision: “Do not be afraid, Abram, I am your shield, your exceeding great reward.” God Himself IS the reward. I feel that sometimes as the Church, we’ve been burying our minds with promises; we’ve been building our homes on promises…on sand. If, in fact, this is the case, our foundation is unstable. God calls Himself the reward. He is it. He is the promise. He is the fulfillment of the promise. When we seek Him, are we truly seeking Him to know him or are we seeking what He has to offer instead? What are our motives? Where are our hearts? On what…or on Whom, are we building our homes, our spirits, our lives? If a promise doesn’t come when or how you want it to come, are you crumbling and washing away instead of standing strong on the Rock; on the Promise? My spirit has been stirring with this. He is our reward. He is faithful to perform His Word in our lives…and still, He is the reward. He refers to Himself as exceedingly great. He is enough. You see, in the beginning when Adam was in the Garden of Eden, he walked with God every day. The purpose of Adam’s life was to live every day walking with God. Adam wasn’t striving or searching for a promise. His foundation was built on God, on the Rock. God’s intent for you and Me is to walk with Him, to know Him, to trust Him…because we can. …because He IS the promise. My life’s journey began September 1, 1987. I am an only child, born in Charleston, West Virginia. I gave my life to Christ at age 12 while attending my current home church, Living Faith Church. I knew at that point that I had a deep love for seeing people pursue Christ. I’ve always had a passion for literature, language, communication, and the arts. I’m very excited about the present and cannot wait to see what the future holds! 12 Aug	This entry was published on August 12, 2013 at 2:31 pm. It’s filed under Thursday's Thoughts and tagged Christ for the Nations Institute, church, devotionals for women, encouragement for women, faithfulness, faithfulness of God, God's promises, promises, WhoIsBeautiful. Bookmark the permalink. Follow any comments here with the RSS feed for this post. Beautifully written, Natalie! You are so right about who we should trust….God. Sometimes hard to do, especially when your faith has been tested, but God IS always faithful. Our new associate pastor just preached a sermon a couple of weeks ago in which she used the acronym FROG, or Fully Rely On God. Very proud of the Christian woman you have become.